Organic Compost | Our Farm by Earth Flora Inc.
Here’s something you should remember. You don’t feed the plants. You feed the soil. Thus, the key to having vibrant plants would be to have fertile soil. And feeding the soil means that you enrich it with organic matter or compost. Our flowers and vegetables derive more than 90% of its nutrition from our compost. Biodynamic or organic compost can replace any chemical fertilizer. Biodynamic compost especially builds the soil and reduces pest attacks. Your compost will increase your yield and improve the life of your soil in the long term. 1. Gather materials that you already have around you. You can use any animal manure you can find near your area. It is best to use fresh animal manure. If the manure is dried, moisten it first with water and pulverize before using. Gather and shred the weeds you have or the grasses that are around you. You can also use rice straw. 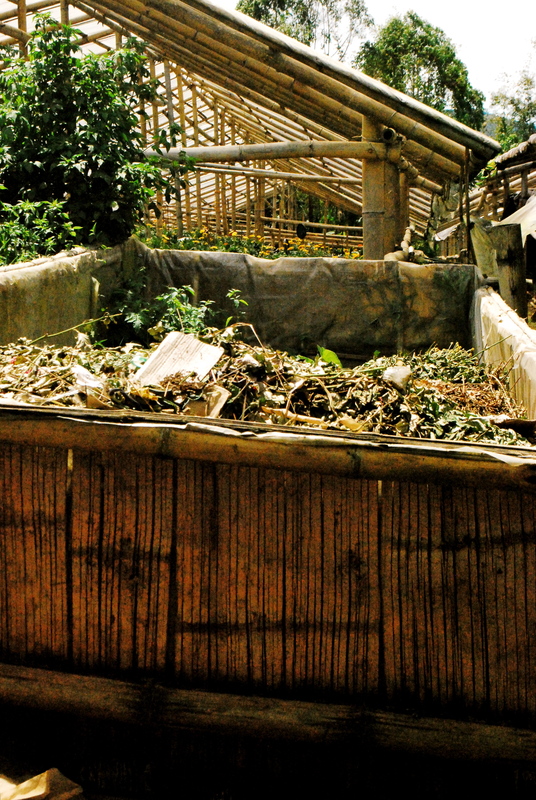 Our farm uses shredded fallen leaves, aged manure, chopped up straw and dead seaweed, plants, compost and sawdust. 2. Identify your compost site and take some time to build a simple composting shed with a roof made of natural materials, or a compost bin. To make a bin, enclose an area of about 1 square meter. 3. If you can, it would be great to add earthworms. 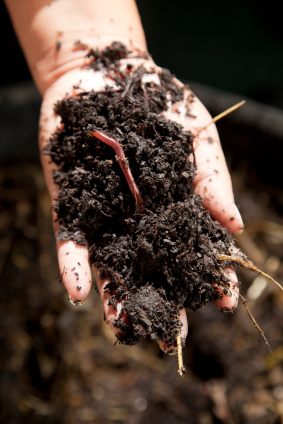 If you already have some earthworms, just put them in the bed. If not, just have the compost piles and the earthworms will come once the piles are composted. See Vermicomposting. 4. Place a layer of plant materials like leaves, grasses and weeds about 15cm thick. If your material is courser, make the layer thicker. If you have materials that tend to compact make the layers thinner. Next layer is 7cm of animal manure. Then layer with 7 cm of lime or ash (you can do away with this layer.) Lastly, add a thin layer of topsoil, enough to cover the surface of plant materials. This is one complete later. Repeat the layers (plant, ashes, soil) until your pile is 1.5 meters tall. 5. Biodynamic compost is different from other composts because of the biodynamic preparations or specially prepared weed and herbal materials. There are 6 preparations used: 502 (yarrow), 503 (chamomile), 503 (stinging nettle), 505 (oak bark), 506 (dandelion), and 507* (valerian.) The preparations do not add bacteria or fungi but instead stimulate the life energies of pile so indigenous bacteria and fungi will be attracted to the pile and break it down. These 6 preparations have been included in one preparation called the Prepared 500. We get ours from Greg Kitma of PhilBio. Our process is just to sprinkle or spray the prepared 500 over the compost pile. 6. Keep the compost bed moist all the time. You can do so by watering the area at least twice a day, one in the morning and another before night falls. To retain moisture, you can put shredded cardboard or newspaper on top of the area or heaps of dried leaves. 7. If you followed the layers, you should have no problem and your compost would be ready after 6-7 weeks. You will know it if your compost pile begins to heat up after 3 days. Just allow it to continue decomposing until the temperature falls. There is no need to turn the biodynamic compost or to place air channels. 8. How do you know it is ready for use? Your pile would have shrunk to ½ or 1/3 its original size. You will also not see the original materials and it will have a sweet woody smell. It would appear like normal soil when it is ready to be used. Just put it around your plants, the way you apply fertilizers. The compost produce should serve as a significant and wise replacement or substitution for chemicals and commercially available fertilizers. In no time, plants will be more productive and healthier than ever. *You may want to plant some compost plants. Corn, sorghum, napier and wild sunflower are good compost plants.